Ministry Marketing Solutions by Pam Perry, PR Coach: Impact…The New Christian TV Network! Are YOU making an Impact as a Christian? Make Good Friday - GREAT. It’s being billed as “the only African American founded national Christian television network; it’s called The Impact Network. Bishop Wayne T. Jackson, is its founder and president, Bishop I.V. Hilliard is also a major stakeholder; other principles include Apostle Stanley Williams, senior pastor of Fire of the Word Faith Center in Jacksonville, FL. According to Jackson, the Impact Network will consist of spiritual, social, political, and community oriented programming. Currently, the network broadcasts on Comcast channel 397 and on channel 40 (formerly WLPC, channel 26) on regular TV in Detroit, but will launch nationally on the DISH Network. Impact Network wants to build out and have positive programs and productions, “We will include everything from health education all the way to spiritual and general education,” said Impact’s General Manager, Terry Arnold. According to Jackson, the type of programming varies, and includes talk/reality shows, music videos, news, family programming, films, cooking shows, spiritual programming, comedy and community development. 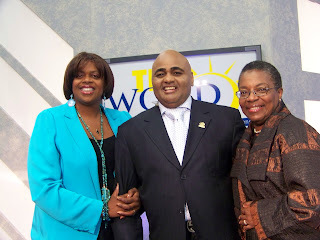 One of the first shows announced is “Good News with Greg Davis” which will air Monday through Saturday at 5:00 pm EST. the show will include a variety of news, talk, empowerment and more. Davis formerly was host of “Rejoice in the Word” but resigned from that show a few weeks ago. Segments of Davis’ new show will be taped at various conventions and conferences and studios. “Impact Network is a spiritually-based, family-oriented network that will help better the lives of our citizens through our programming,” Jackson stated. See This Month's Gospel Today magazine. TD Jakes cover story. Also see Pam Perry's Column Social Media and Branding Online. Social Media Has Changed: Are You Ready?